In my previous post I discussed the struggle with staying in an optimistic entrepreneurial mindset when you feel like all of the good ideas are gone, the market is saturated, and opportunity has left the building. I surmised that this is just a feeling and not reality. Well, along the same lines, I have another question I want to ask you about. A few weeks back Seth Godin wrote a post about Same as it ever was where he displayed two of the first portraits ever taken and basically as asked: could they have been taken with Instagram? The point he was making (in my opinion) is that there's plenty of opportunity in products, services or technology that already exists. History is full of examples of companies who did not pioneer their core offering, but came to dominate it anyway. Think of the way that Apple has come to redefine and dominate the market for mobile devices—a category pioneered by Motorola. Boeing did not pioneer modern jet travel, nor Google the Internet search engine. Yet both companies are now industry leaders. No need to fool yourself into holding back just because your innovation or product doesn't contain a flavor that's never been tasted before or an experience previously unimagined. This is a terrible quality video, but the only one I could find. We make fun of the five thousandth To-Do app, or the social network for X. NOOOO, not another project management tool. Anybody want to build another CMS? There's been tons of silly ideas (and as developers we've built them) yet occasionally something new will surface that competes with the industry leader and even surpasses it. What made Slack different from Hip Chat? What made Gmail different than yahoo mail? I'm not that knowledgeable about all the different startup successes and failures, so you fill in a few blanks of the ones you know. My question is, when are competiting products valid? When are they seen as another lousy idea? In business school, I frequently thought of the old business tycoons who were in the beginning of their industry's heyday: Henry Ford (autos), J.P. Morgan (banking), Cornelius Vanderbilt (shipping and railroad tycoon), John D. Rockefeller (oil). I'd think, if I'd been born then, business would've been easy. In hindsight, it all seems so obvious: trains, growth, ships, oil, investment, factories, etc. etc. For the last couple of years, I've been wanting to create a business (in addition to my consulting) around a SaaS (software as a service) product. Since probably 2005, SaaS businesses have grown rapidly. Now it seems there's an app for everything and anything. I've become to think that the SaaS market is saturated and opportunity is few and far between. If this is true, this also affects my consulting business because if the opportunity isn't there, then less and less entrepreneurs will need my consulting to help build software. So like many entrepreneurs, I began to feel pessimistic and downcast about the future. But like most entrepreneurs, this was a brief spell. If we could climb into a time machine and journey 30 years into the future, and from that vantage look back to today, we'd realize that most of the greatest products running the lives of citizens in 2044 were not invented until after 2014. I believe that. Heck, 10 years from now, we probably won't be using the majority same tools, services, and technologies we're using today. Major platforms like the web and email may still be around, but they'll probably look vastly different. For example, 5 years ago, the majority of all email was hosted on an exchange server, or an in-house pop mail server. Now, the majority of people access their email in the cloud through different devices and clients. Because here is the other thing the people in 2044 will tell you: Can you imagine how awesome it would have been to be an entrepreneur in 2014? It was a wide-open frontier! The one thing that is constant is change and people have been innovating since the beginning of time. There's opportunity in the future. You have to be willing to learn, change and visualize if you want to take part! So now the hard part...what's next? What's the next big shift in technology? What will are you working and investing your time? This morning I read a Quora question posted by a student who wanted to learn Ruby on Rails, but wanted to know how easy or difficult it was to get a rails job. I really like the response from a developer at Spotify. He said that right now, it's easy to get a rails job and it pays competitively with other like developer positions. However, he said you cannot hang your hat on any one technology. If you want to be a great developer, you have to be prepared to learn constantly. Constant learning is only behaviour that is guaranteed to get you hired at the best companies and to give you job security as a programmer. This is common to all great and well-paid developers - develop a hunger for learning. Learn because it fascinates you, not because it will land you a job. Ironically, it is this attitude that WILL land you the best jobs, and give you security long-term. I agree. When I started my company in 2008, I was constantly astonished by the degree with which each project differed. I always told my wife, if I could just get one project that was like the last we could really make a profit. The truth is, even if you do get two projects that are similar, if they are more than 6 months apart, some technology is going to have a different "better" way of implementation. Now, that's not to say that experience doesn't account for anything. It does in a big way. When you have to update a gem or software version, the more experienced you are, the more quickly you'll adapt, but you'll never stop learning. If you do stop learning, you're likely going to get left behind. Yesterday I was out on a bike ride with my friend Matt Smith and he told me he'd been challenged to write a blog post every business day for the next 30 days. He didn't call me out like the Ice bucket challenge, but he asked if I wanted to do it too. So I accepted. At the beginning of this year I decided I really wanted to write more. I'd read about numerous people like Nathan Berry writing 1000 words daily or John Saddingon's obsession with blogging and decided I wanted it to be a part of what I do. So I thought I'd take some time and figure out why should I write? I've never been great at writing. I've always been better at Math than Reading/Writing (my math score nearly doubled my English sore on my SAT's). I realise I don't have a natural ability to write, but I believe it is something you can vastly improve on if you practice at it. Writing and communication is critical in any career, but I believe as much or more so than anywhere it's critical in software development. Whenever I write something I'm able to turn a lot of incomplete ideas and thoughts into something meaningful and organized. If it's a technical post where I'm explaining something I've built or designed, then I learn even more than what I did when I first built it. It's also an opportunity to teach. I met Dr. Maya Angelou once and had dinner with her in her apartment. One of my favorite quotes from her is When you get, give. When you learn teach. I've learned so much from others sharing what they know. I've literally gained a 2nd education from the internet. I'm hoping to just pass a little on! To write is a creative process and I believe it just breeds more creativity. I'm the most creative when I'm writing often. I'm more creative as a developer, designer, marketer...just all around. I hope that by being open, honest, communicative, and sharing more about my life that I'll meet more people, build better relationships, and enable clients to be more comfortable because they already know a little about who I am and how I think, how I operate, and what to expect. Hopefully my writing will bring an audience and an audience will bring opportunities. Whether through client work or partnership opportunities or my next business partner, writing can bring opportunity in the door. This isn't meant to be an exhaustive list, but the top reasons on my mind right now. I've been running a small business now for 11 years and I think I've finally settled on a simple way I like to answer the key question...are we making money and if so how much? It adds all of your cash accounts like checking and savings, personal as well as business. Then it adds all of your investment accounts. I always enter these numbers at the exact same time every month. I do mine early in the morning on the 1st of the month so I'm getting my cash account and investment numbers for the close of business at month end. Now this might look pretty simple, but in the myriad of financial statements you can generate, this is a straight forward indicator of whether or not you're building wealth / value. I have an accountant that gives me all sorts of valuable statements like an income statement, balance sheet, statement of cash flows, etc. Those are important, but one main problem is that my business and I are really one in the same. If I make a personal withdrawal from the business, my cash flow statement will show a deduction, but my personal account will show the addition. I want to know what's going on overall. It's a good idea to keep your business and personal accounting separate, but if you own a small business, you want some way to track an overall value. Not that it should, but as far as I'm aware, there's not any accounting software that will give you a snapshot across multiple companies / personal accounts. One thing to note is that this is not an indicator of productivity on the previous month. You might have a killer month, but not get paid for it until the following month. It's really about keeping track of added (or hopefully not reduced value) over the course of time. I like seeing the monthly change in value, but the main two I look at are the YTD Change and the Monthly Average. 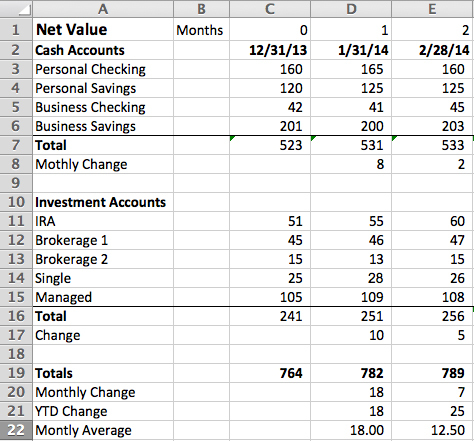 The YTD Change lets me know overall if I'm adding value to my net worth. Over the last 12 months, did I build value, maintain, or loose value? The Monthly average let's me know on average how much extra cash (if any) I have available each month. It helps answer questions like: can we afford a new car payment, or can we increase our monthly retirement contribution or can we increase giving to our church? As a small business owner, your income is far from fixed, so answering those types of questions are difficult. This indicator gives you a little insight. I hope that might help someone out there. This is definitely no substitute for real accounting software and/or an accountant, but it's a nice snapshot of where you're at and how much you've grown. Here's the excel file if you want to download it and customize it for your own use. Let me know if you add anything to it or have other methods for your financial analysis.